Indications: Coughs, Irritable Respiratory Conditions. 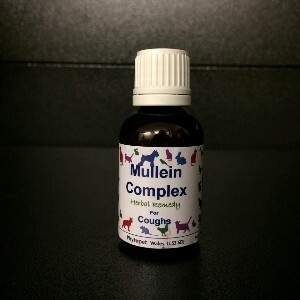 A combination of herbs traditionally used for coughs and other respiratory conditions. Mullein (Verbascum thrapus): Mullein’s is a soothing relaxant for irritable respiratory conditions, reducing cough severity, acting as an expectorant. Traditionally used for Asthma, Bronchitis, Deep Hollow Cough, Emphysema. Coltsfoot (Tussilago farfara): A relaxing expectorant. Traditionally used for dry unproductive coughs. Wild Thyme (Thymus serpyllum): A well known expectorant with anti-bacterial anti-viral and antiseptic properties. Traditionally used for all respiratory infections. Liquorice Root (Glycyrrhiza glabra): Liquorice has a long history of use as an expectorant. Used in traditional Chinese medicine for Tuberculosis. Particularly useful for dry coughs and horseness. Wild Cherry Bark (Prunus seotina): Traditionally used for Bronchitis, Asthma, Croup and dry hacking coughs. White Horehound (Marrubium vulgare): Traditional expectorant.